Preview: Six O’Clock High – ColePowered Games Ltd. So this is a action-packed 2D dogfight game, which at this stage I’m calling ‘Six O’Clock High’. It’s a much smaller, less ambitious and more focused project than I usually do work on– and something I’m going to complete by the end of the month. I’ve wanted to make a good little aircraft shooter for quite a while now, I remember making a similar attempt at one when I first started making games years ago called ‘Dogfighter’. It was terrible and never released but the idea remained at the back of my mind. Six O’Clock High on the other hand is quite different. First off, it’s ultra-simple. 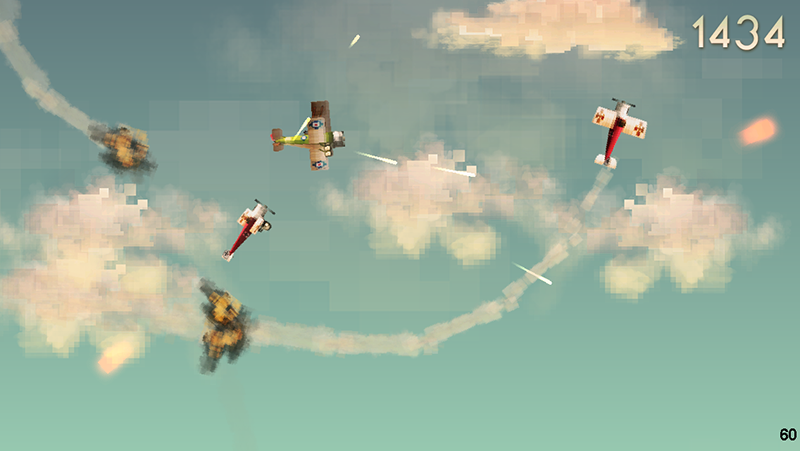 In the game you take control of a two seater biplane, the player is the pilot with the gunner being AI. 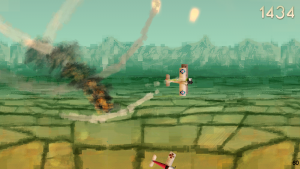 The game is all about piloting, dodging enemy fire at high speed while manoeuvring into a good position for your gunner to get a shot on the fokkers. I’m designing this with touch screens in mind. One thing I definitely wanted to avoid was on-screen buttons. I’ve never found them appealing as a control mechanic, as it always feels like I am playing something that would work better on a controller which bugs me. So for this I had to come up with a control scheme that made sense without traditional controls. What I came up with was a system that turns the plane around your touch relative to the aircraft’s position. To turn upwards simply touch above the plane, or down below the plane. While this scheme takes a little getting used to, it soon feels quite natural to me. I hope others will find it easy and accessible too. 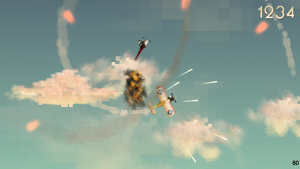 Another thing to note is that there isn’t a fire button- your forward guns will fire if there is an enemy infront of you, and your gunner will fire if there’s an enemy within their field of view. I didn’t want to have to make the player fiddle around with fire triggers, in this game it’s all about the flying. The graphical style is something I’ve been working a lot on. I first mentioned I wanted to experiment with a mashup of painted and pixel art style graphics a few weeks ago in my dev blog, and this game is very much the result. The colouring is also something I’ve been tweaking a lot, I’m going for a slightly washed out colour palette which makes the whole game look like an old technicolor film. These early screenshots and the graphics are subject to change, but I’m quite pleased with how it looks so far. The gameplay itself is wave-based survival. At the end of each wave your aircraft will receive a repair and you’ll get experience points to put into a tech tree to upgrade your aircraft. I’ve yet to flesh out the upgrade tree itself, but this should add a little strategy to what is otherwise a very fast-paced action game. Since I’m using Multimedia Fusion 2 to make the project, I also want to expand the game to play on other platforms. 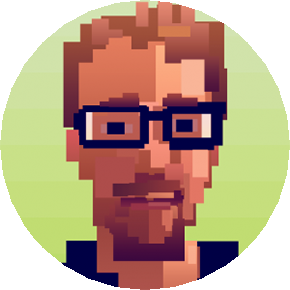 I’m planning to make a free Flash version, and minimum-cost XBLIG, Android and iOS versions. Windows Phone too is a possibility. Stay tuned for more updates on Six O’Clock High and a release in the not too distant future! A Six O’Clock High Update! I love the art style! 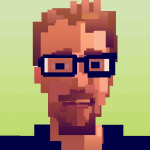 It’s like a cross between retro/pixels and watercolour. Really beautiful. Thanks glad you like it, I was going for something a bit different! This looks really pretty. I guess you used prerendered 3D models for the planes. I also like the artdeco counter. Nice touch! 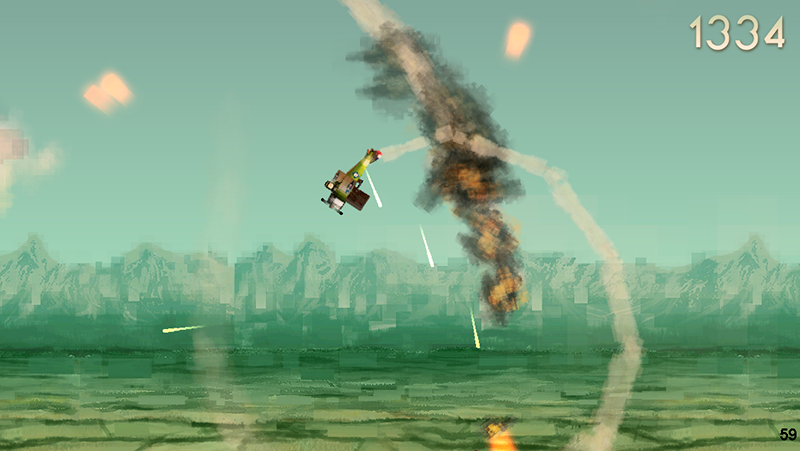 Yep, I’ve been creating all the plane models in 3D and rendering them so I can simulate barrel rolls. The challenge is fitting the 3D rendered stuff in with the rest of the stylised graphics. I don’t think it’s quite there yet but I’m working on it. This looks superb!!! I love the big sizes pixel art style! Looking forward to the demo and / or the game! When the game will be released?